Go out the East Exit. You will face LABI in front of you. Cross the busy street and walk down the smaller street so the Tokyo Mitsubishi UFJ Bank is on your left. When you get to the corner, LABI should be on your left. 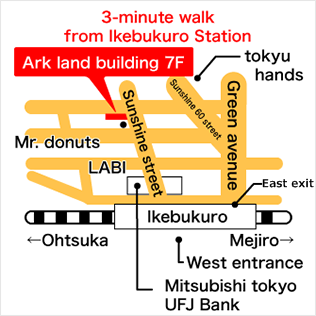 On the far corner you should see “mister donut”. Nissait is in the building next to “mister donut” on the 7th floor.